Sinusitis definition: what is it? Comes Winter and Cold weather and comes with it the epidemic of cold and viruses, which can extend all the way through the Spring to finally give everyone a break with the first shining of summer sun! Even though most people like to say that they have allergies because it is more psychologically acceptable; some might have something called sinusitis! Sinusitis is a condition that is not restricted to a specific weather. So, what is a sinus attack? Is it the same as the common cold? Is it a kind of Spring Allergies? How can you spot it? How to prevent it? Here is what you need to know. 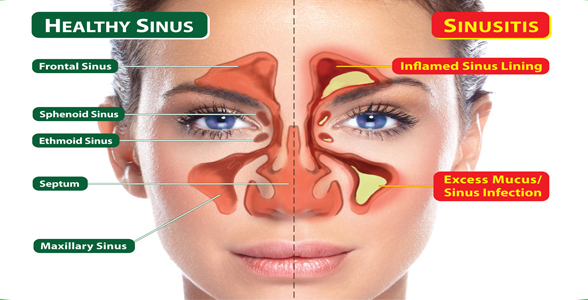 Sinuses are the four pairs of spaces in your skull that are covered with a mucous membrane. There is one pair in the forehead above the eyes, one inside the cheeks, one behind the bridge of the nose, and finally another pair also behind the nose but underneath the brain. Even though these are the four pairs, but not every person has the entire set. Think of it more like every person has a personalized number or these spaces. The normal functions of these sinuses are to keep the inhaled air humid and warm; also, they provide a form of isolation for the eyes and nerves. Sinuses also help boost up the voice resonance. Remember: Sinusitis is an inflammation of the pounches! Sinusitis: What are the Main Symptoms? There are many symptoms including a stuffy nose, pain and pressure around the face and teeth, and a yellow, clear or green nasal discharge. Some people might feel fatigue, a change in their smelling capacities, cough, sore throat, bad smell, and headaches. If sinusitis lasts for more than several months back to back, then we are talking about chronic sinusitis that leads to the accumulation of bacteria in the cavities or could even be triggered by a bacterial infection in the first place. There are several other causes for this form of sinusitis that ranges from anatomy and immune deficiencies to dental diseases. So, here is a recap of the complete list of symptoms for each one of the four types. These actually will let you identify which is the one you are experiencing! Acute sinus infection: The main symptoms of this type are a stuffy nose, some congestion, feeling pain around your face, having some headaches and pressures and finally blowing discolored mucous that looks cloudy. Symptoms would last up to four weeks. In case the symptoms went away within ten days and the severity was stable; then, it is probably a viral infection. If the symptoms. Subacute sinus infection: symptoms are the same as acute cinus infection but would last from four to eight weeks. Chronic sinus infection: symptoms last longer than 12 weeks and you will feel facial pains and pressure and nasal drainage. You will have a lowered sense of smell. You will also feel very tired. Recurrent acute sinus infection: you have this type of sinusitis if you have more than three episodes of sinusitis or more than would last for two weeks each. Sinusitis Diagnosis: How do you Know You Have Sinusitis? Under normal circumstances, one can be diagnosed for sinusitis through the patient’s history and by a physical examination. Here is a more detailed answer that is according to the four types of sinusitis. Acute sinus infection: For this type of sinusitis, you do not need to do any kind of CT scan or x-ray. It is diagnosed according to the symptoms and a physical. Chronic sinus infection: It is important to get a CT scan to help yoru doctor identfy which are the sinus pounches that are getting infected and if you have an anatomic obstruction. In addition, some might do a nasal endscopy to look for any skin abnormality. Recurrent acute sinus infection: a very thorough examination is needed to determine how we can solve this type. Sinusitis Risk Factors: Is Sinusitis Dangerous? Sinusitis, in most cases, gets resolved without any complication. Very rarely, the infection could spread to the brain through the walls of the sinus pouch.This could be dangerous and would need immediate attention. People with very weak or supressed immune systems are the ones at high risk of complications. Sinusitis: how to prevent an attack? There is very little information about how to fully get rid of any sinus attack; however, there are several measures that you can take. First of all, you should stay away entirely from any harsh irritant such as cigarette smoking, cigars and hooka, and harsh chemicals. Second, make sure you don’t get cold by washing your hands regularly, sanitizing, and staying away from sick people. Finally, having an allergy evaluation test done to determine what you are allergic to. Sinusitis Treatment: Do you need meds? Most people try to use nasal decongestants. The truth is, these can only be used for just a couple of days after which they start shutting the nasal passages again. Better solutions could be saline sprays or nasal steroid sprays. Check with your doctor about the best solution for your acute attack. Please understand that taking antibiotics is not needed. Sinusitis is usually triggered by the common cold virus (The Rhinovirus), and viral infections typically clear by themselves within two weeks. Finally, antihistamines could also be of help for sneezing and runny nose symptoms. Acute sinus infection: If the symptoms last ten days, this means that the sinusitis is due to an infection: a viral one. In that case, you would need decongestants, intranasal steroids and saline sprays. You do not need any antibiotics. In case the symptoms last more than ten days and are getting worse; then, the infection is bacterial and you will need the same as above but with the addition of antibiotics. Subacute sinus infection: You will need some intranasal steroid and antibiotics. Chronic sinus infection: This type of sinusitis is due to an inflammation and not an infection. So, you will feel swelling of your nasal passages and a build up of mucous. This build up will promote the growth of bacteria. So, your treatment will be a long period of antibiotic that can last up to six weeks. You will also need some intranasal steroids, saline sprays as well as oran steroids. Recurrent acute sinus infection: This treatment will be a little bit different. As a conclusion, one can understand that even though symptoms might be a little similar between common cold and sinus, One main factor needs to be taken into consideration: What differentiates between them is the length of sick days. The common cold might last about six days (2 to 3 days a runny nose then 2 to 3 days stuffed nose) after which a person starts feeling much better. For the sinuses, things will last longer.